NEW ARTICLE IN THE MARION NEWSPAPER! It is a mix of the amenities of the original Elgin Hotel that are being retained where possible and being recreated when not, and the conveniences of this era. The former Elgin Hotel, the statuesque three-story building at the corner of Third and Santa Fe streets, Marion, has been in the process of renovation for a few years. For Jim Cloutier, it has been a labor of love and patience. He had the vision of taking the Elgin apartment building and restoring it to its former beauty, making it and Marion a destination location. 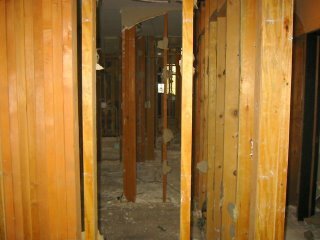 The process started with gutting the entire building, taking the interior to bare wood. 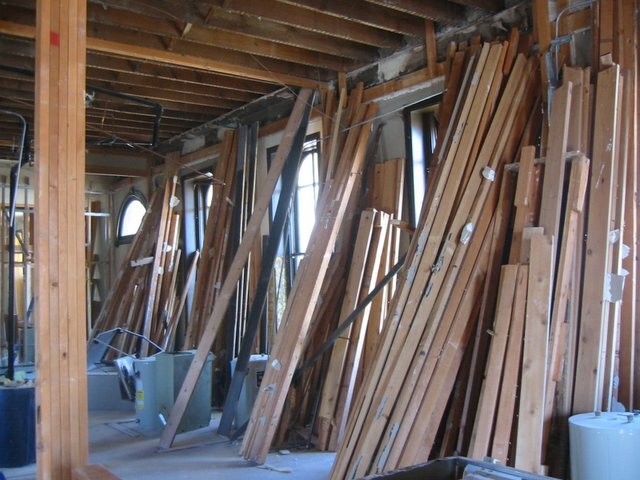 Since that startling process, the interior is taking shape with wooden pillars and a marble floor in the main entry where a fine dining restaurant will be located. The second floor, which is near completion, provides eight bed and breakfast suites, a common parlor, dining room, and kitchen. 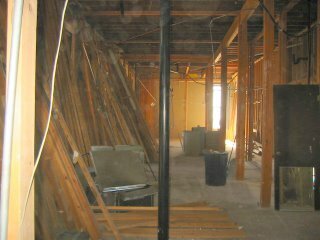 The third floor will be the living quarters for Jim and wife Nancy, who currently live at Hillsboro. A new spiral staircase near the center of the building is the primary access to the upper floors with an elevator remaining in operation for those less enthusiastic about the climb. Ceiling tiles on the main floor rivals any tin ceiling from the turn of the century with gilded cornices and crown molding. The ground floor used to have a dozen apartments or so which now have been divided into a waiting area for the restaurant complete with fireplace, a dining area, kitchen, and ballroom or reception area for special meetings or events. The bed and breakfast area, also formerly divided into numerous apartments with narrow hallways, is now spacious with open areas for guests to sit and visit or eat meals. The largest most spectacular suite will be named for Marion’s well-known first son, Kansas Governor Edward Hoch. Furnishings will fit in with the historical significance of the 1880s building, Cloutier said. So, when will the impressive project be completed? “We plan to finish by Christmas,” Cloutier said. Finishing touches include the installation of the original railing from the second-story balcony. “We’ll have to update it some,” Cloutier said, referring to the height of the railing being about knee-high. “We want to utilize the balcony area but will have to raise the railing for safety purposes,” he said. And what about that spectacular restaurant? “I’m not going into the restaurant business,” said the owner of Shawmar Oil Company. Ideally, Cloutier wants to lease the restaurant area to an entrepreneur. Staircase inside the main entrance. There was a nice article about the renovation in the Nov. 22nd issue of the Marion County Record. Check out the Elgin House article about halfway down the list of headlines. It's been a dream of his and now is his opportunity to make it happen. Jim Cloutier of Hillsboro said he always wanted to refurbish a house and never dreamed he would be doing an entire building — and not one like the former Elgin Hotel, near downtown Marion. The building was renovated in the 1970s for apartments. "What they did in 1977, they did well," Cloutier said. "They don't make lumber like this anymore." Hundreds of 2x4s lean against walls and supports with few knot holes and bends or signs of warping. They will be used for reframing. 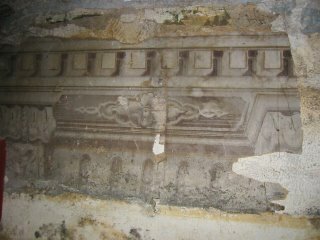 One gem that was discovered in the gutting process was old wallpaper that was located in obscure areas, untouched by modern renovations. "I'm not sure which era it's from but it's old," Cloutier said. The owner of Shawmar Oil Company of Marion, and Cardie Oil Company of Tampa, is at a point where day-to-day operations have been turned over to family and employees. "I'm thankful to be at a point where I can do this," he said. And he means to physically do this. Cloutier and daughter Blythe Settles are a two-person wrecking team. 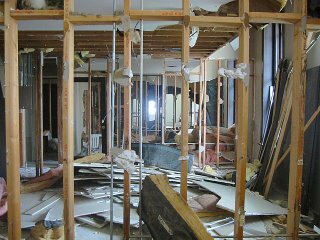 They have been demolishing the first floor of the building and it is impressive to the casual observer. 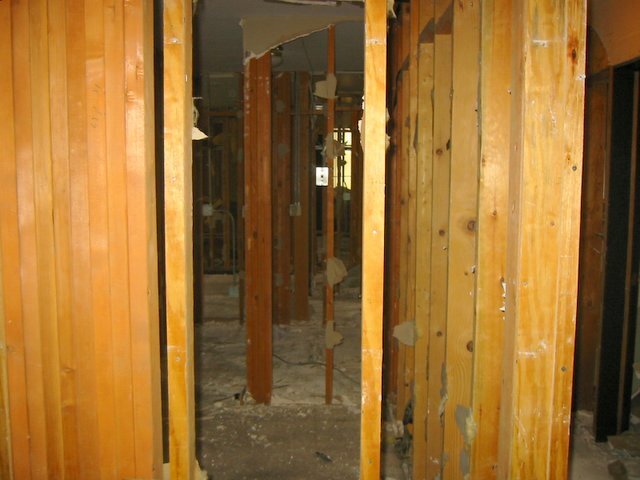 Gone are the individual apartments, Sheetrock, fixtures, and lowered ceilings. 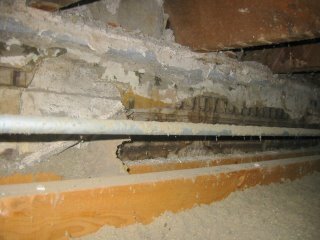 A few exposed pipes where bathrooms used to be and duct work are all that remains. "This area is going to have a three-story, spiral staircase," Cloutier said, pointing to an area in the middle of the north part of the first floor. A restaurant is being planned in the northern part of the northwest corner of the first floor. "This is going to be a formal, fine dining restaurant," Cloutier said, like nothing else in the Marion area. He plans to hire a chef to manage the eating establishment, saying he wasn't a "restauranteer." The area will be able to seat 60 people with a nearby conference room available to accommodate special parties and for "spill over" from the restaurant. A ballroom also is planned on the first floor which can be used for receptions, parties, and additional restaurant seating, if necessary. A parlor also will be available for those waiting for a table. 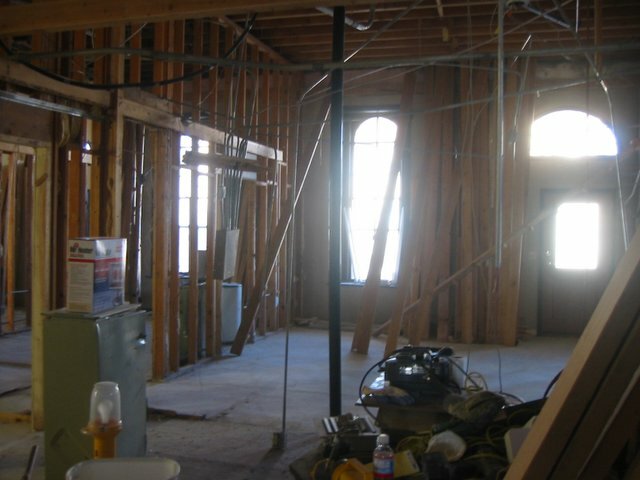 The second floor will have eight luxury bed and breakfast suites. 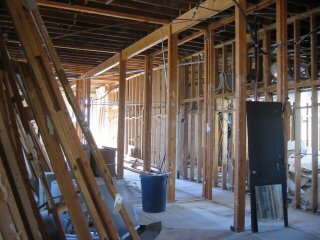 There will be a kitchen, dining area, and parlor. Luxury apartments for retirees are being planned on the third floor. "There will be an apartment available for the chef and his or her family," Cloutier said, and an additional three or four apartments, targeting older people who want to live in an upper-scale apartment with the availability of a restaurant within the building. 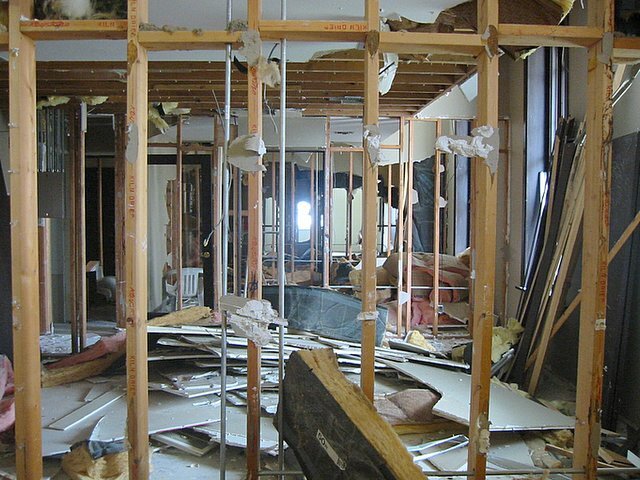 Since the pair, with occasional help from Blythe's husband, began the renovation process at the end of September, the remodelers' goal is to have demolition completed by Christmas. "I hope we can start framing after the first of the year," Cloutier said. He plans to do as much of the work as possible but will probably sub-contract the Sheetrocking. "I hope to be open for business within 18 months," Cloutier said. The restaurant and other first-floor amenities are first on the list, followed by renovations to the second floor, and eventually the additional apartments on the third floor. 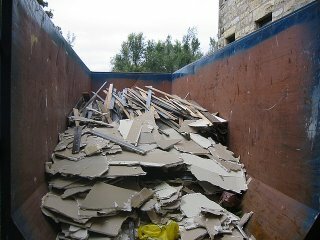 A Dumpster for materials, located outside of the building in the garden area, has been well-used and filled several times. 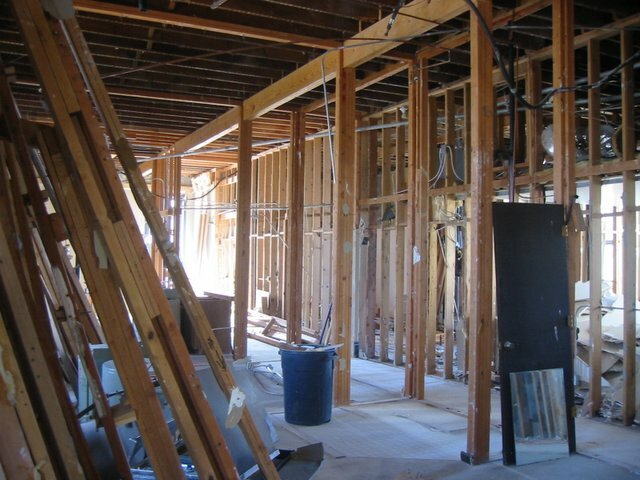 "The nice thing about this remodel, the hard stuff has already been done," Cloutier said. The remodel job of the 1970s will serve well as a solid base for this remodel. Wanting to do it right the first time, Cloutier has hired an architect firm that is familiar with historic buildings. Pettijohn and Kenney of Overland Park is the same firm that assisted the City of Marion with the renovation of the former Santa Fe Depot into Marion City Library. 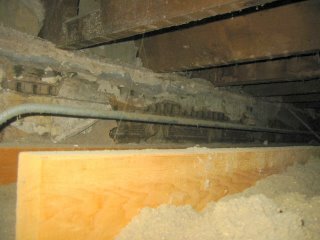 Assistance also is being provided by other entities that provide ideas and information for the building to meet all compliance issues. An engineer will be tapped to provide a review of the structure of the building so any potential issues can be addressed before interior work is started. 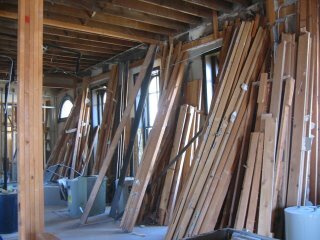 The furnishings of the main floor will be classic Victorian, Cloutier said, with "a lot of wood and wallpaper." Cloutier's wife, Nancy, will assist with the decorating aspect of the project. An ultimate goal is to landscape the garden area, located in the "U" of the building on the west side. "That area could be used for weddings or other occasions," Cloutier said. Also part of the grand plan is for daughter Blythe to offer wedding packages which could include a garden ceremony, a reception in the ballroom with food served by the restaurant, and guests staying in the bed and breakfast. Local florists and photographers also could be involved in the promotion to complete the package. Stained glass exterior windows also are being considered, Cloutier said. The plan is to serve local and area residents, and to attract those from out-of-town who are looking for a unique dining experience which could include a night's stay. While surveying his accomplishments of the past eight weeks, Cloutier took a deep breath, smiled, and said, "Well, it's too late now to turn back. We can only move forward." 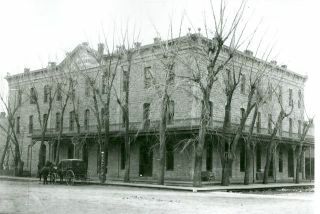 According to the book, "Marion County Kansas: Past and Present," by Sondra Van Meter, the elegant Elgin Hotel was built for $25,000 in 1886 and opened Sept. 15, 1886, with a banquet and ball. 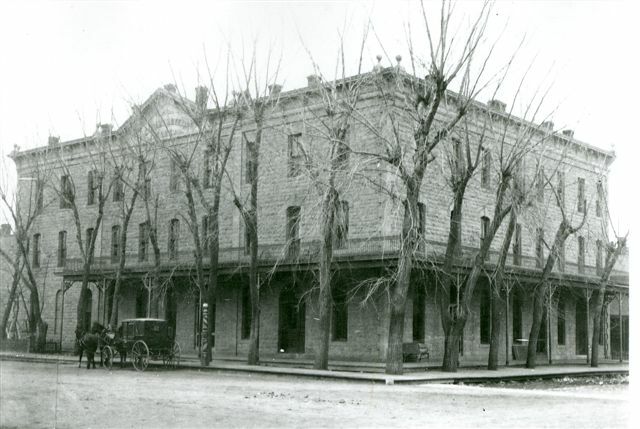 Located at Third and Santa Fe, the three stories was built of magnesium limestone, cut by local stone cutters, had 42 rooms, a dining room that seated 80 people, and billiard and card rooms. Travelers coming on the Rock Island or Santa Fe stayed overnight in the beautiful hotel while salesmen used it as their headquarters while peddling their wares in the county. The Elgin closed in the 1950s. 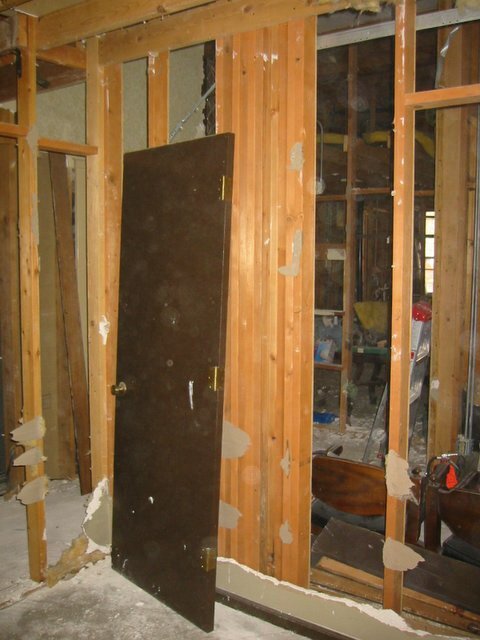 All of the furnishings were removed. 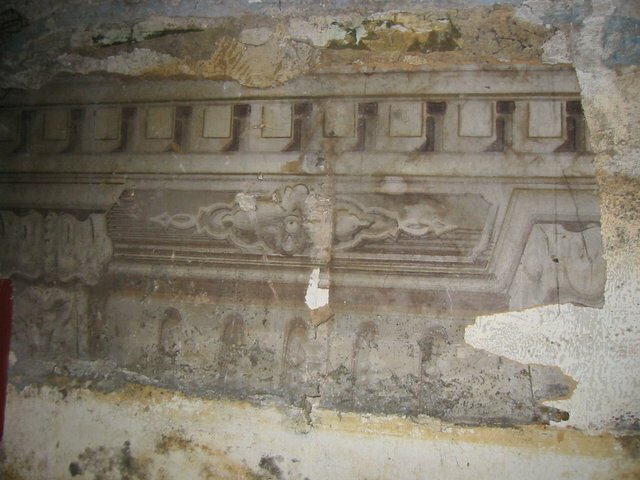 In the 1970s, it was purchased and renovated for apartments. In the 1990s, the building was on the auction block and purchased by Jim Strawn of Hutchinson. He also updated the interior. Cloutier then purchased the building in September where his dream began. The framing is starting to come down! It's starting to open up inside. It didn't take long to fill up the dumpster!